An old man sits in a room cluttered with an array of recording devices he has collected over the years. He opens a drawer, takes out his pipe, unscrews his flask and pours himself a cup of tea . . before settling down to record his last tape. ‘Tony’s Last Tape’, written by Andy Barrett and performed by Philip Bretherton, is based on the famous diaries of Tony Benn, one of Britain’s most respected and controversial politicians. It examines the struggle of a man who realises it is maybe time to withdraw from the fight, to let others take over - but just doesn’t know quite how. 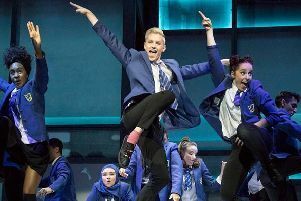 The show was a sold-out success at Nottingham Playhouse and was critically acclaimed at the Edinburgh Festival last year. It will be staged at the Lawrence Batley Theatre, Huddersfield, on September 20 and 21 at 8pm. Tel: 01484 430528.